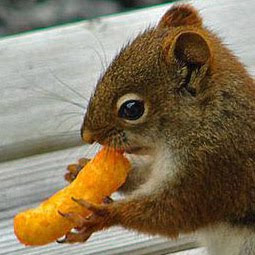 Cheetos for Breakfast: Fit for a Queen? Back in early '95 some friends were getting rid of a queen sized bed and asked if we wanted it. At the time we had 3 kids under the age of 5 who, strange as it seems nowadays, actually liked being with us. Especially at night. Our bed was full so an extra 6 inches of horizontal sleeping surface seemed like a dream come true and we took it. This had been our friend's bed before he got married and he was not a small man. Plus, he had done what anybody does when you don't have to share a bed; he slept in the middle. Therefore, by the time the mattress made its way into our possession it was really less of a mattress and more like a large, springy bowl. The mattress made its way in the wear 'n tear department serving as trampoline and changing table and sleeping surface to sometimes upwards of five people, the kids piled up like puppies on all sides of us. Within a year the bowl had deepened significantly. By then I was hugely pregnant (I was always hugely pregnant) and found getting out of the bowl a useless fight against laws of physics. Without the wherewithal to rig a pulley system or a catapult, Matt took to shoving me from the back any time I needed to exit the bed. By the time Baby #4 made her appearance (ON the bed, by the way), we knew the vast expanse of springs, fabric and dust mites had to go. I would spend the entire night attempting to defy gravity by not rolling downhill into my husband. Sometimes I was unsuccessful and we crashed in the night like a couple of bowling pins laid to waste. Then one night I had just finished nursing my newborn to sleep. She was peacefully snoozing on the outside edge of the bed when I sat up and watched her roll, literally ROLL, downhill toward the middle. Like a burrito or maybe an egg roll caught in an avalanche. From there on out my memory is fuzzy, likely due to lost sleep. The mattress was passed on to some unsuspecting soul or perhaps to the landfill, I do not remember. I do know that I have never taken a good mattress for granted again.